The assault on the settlements of the Venetian lagoon in 810 by Pepin, the son of Charlemagne, created an historic shift in the residential pattern of the lagoon dwellers. Pepin's Frankish forces quickly seized Chioggia at the south end of the lagoon and then Palestrina, the southernmost of the major barrier islands that protect the lagoon from the Adriatic. Malamocca, the Venetian capital and one of the most populous of the Venetian islands, lay next in its path. The channel between Palestrina and Malamocco ultimately proved to be Pepin's Waterloo and the point where his advance was stymied. While the issue remained in doubt, however, the capital was removed to a more protected group of islands near the center of the lagoon. That area was known as Rivo Alto, or "Ri'Alto" [high bank], because the islands were sedimentary banks of the Brenta River delta, whose mouth lay several kilometers to the west. 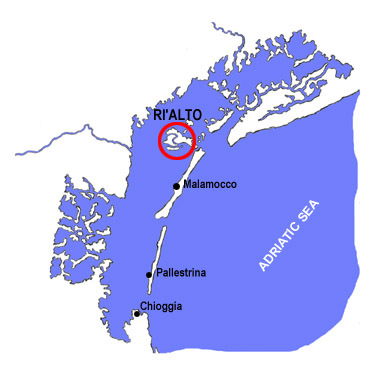 Many Venetian families also removed to Ri'Alto, seeking the protection afforded by the treacherous shoals that lay between Ri'Alto and the invaders. After the Frankish threat had passed, the capital remained at Ri'Alto, together with a concentration of the new residents. In later years, the population of Ri'Alto grew rapidly, its land area expanded dramatically by landfill behind rows of pilings. The area at Ri'Alto soon became the metropolitan center of the lagoon, the city known today as Venice. "Rialto" survives as the name of the commercial area that surrounds the oldest bridge on the city's Grand Canal, which is itself the vestigial river bed of the Brenta River.